where a VERY chubby Laurence Fishburne ... as in Morpheus from The Matrix, emerges from the jungle and saves the characters and takes them back to his crashed space ship. 2009 saw some of the best recent science fiction released, the best probably being, District 9. 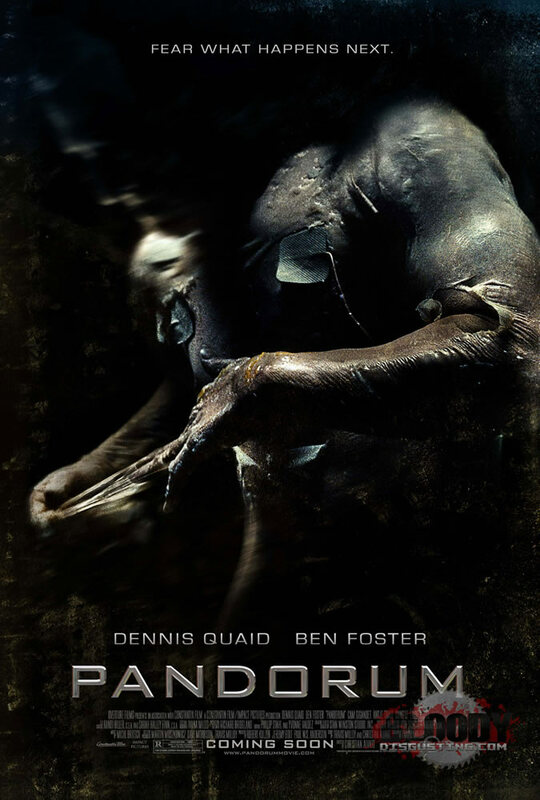 However, easily in the top ten was the little reported and underpreformer in the box office, Pandorum. This German funded film with American actors suffered probably because of its name and its movie poster which doesn’t give an indication of what to expect in the movie. They obviously feel the same way as the DVD box cover to the right has been altered to the much cooler matrix hand concept. If you haven’t seen either movie stop reading now! A classic thriller Pandorum follows various characters as they wake up on an ancient immense space craft not remembering anything but fragments of what their mission is and what is going on. As they progress through the ship they learn more about what is happening around them and who the “Hunters” are. A classic story of how humanity is doomed to kill itself there is one scene where the crew are betrayed by another crew member who survives by lulling guests into eating drugged food and then stealing their stuff. Fastforward one year and Hollywood pumps out another Predator movie that is constructed in such a way that it’s a total one-off flick that has no affect on the cannon of the Predator series. I won’t go into the movie but there is a scene that if not inspired by is copied directly from Pandorum. What’s amusing is on this alien planet that the film takes place it is a jungle planet but to make this scene work the writers created this giant spaceship that just happened to have crashed on the planet and still has power. The plot progresses where a VERY chubby Laurence Fishburne … as in Morpheus from The Matrix, emerges from the jungle and saves the characters, taking them back to his crashed space ship. There he pretends to sleep and then in an almost direct rip from Pandorum the Fishburne character (who both, I hope by coincidence, are black) tries to drug the characters and steal their stuff. Luckily for our “heros” he fails and in a way that I’m sure his character who has survived amongst the Predators for a number of seasons is killed in a ridiculous manner. I’m not slamming the movie or anything the whole “imitation is the greatest form of flattery” and such, I’m just curious if the two scenes are in fact linked.